One show stands apart from the current wave of phenomenal small screen programming. 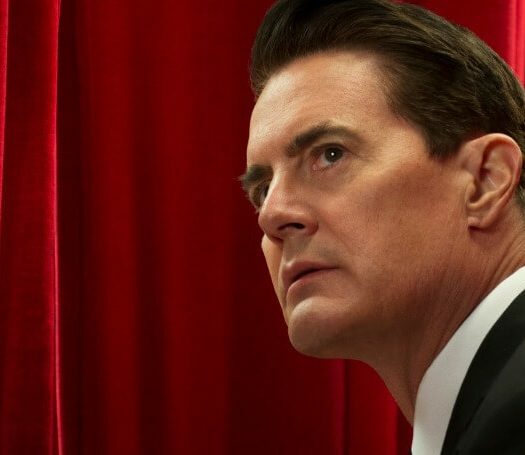 “Peak Television” shows little sign of stopping. If you haven’t watched “Billions” yet, I can assure you it’s not the show you probably think it is. You won’t see story lines bashing Wall Street and corporate excess. So what is “Billions” about? The show, which just earned a third season pickup, follows two driven people with massive egos and powerful organizations at their disposal. Stars Paul Giamatti and Damian Lewis lock horns in a fiscal death match each week. While HBO focuses on excellence in storytelling, Showtime delivers on exemplar character development. The network’s actors help bring these characters to life. There’s a depth and nuance of the key players in “Billions” that make it a pleasure to watch. The non-binary gendered “Taylor” (as an avatar for Millennials) is a nice contrast to the “zero sum game” being played by Bobby Axelrod (Lewis) and Chuck Rhoades (Giamatti). They’re like the last two cars in a demolition derby. Remember how good Giamatti was in movies like “Sideways” and “Saving Private Ryan?” Well, he’s back and amazing in this. Maggie Siff of “Sons of Anarchy” fame expertly plays Wendy Rhodes, the very competent spouse of Chuck Rhoades and corporate psychologist to Bobby Axelrod and Ax Capital. Malin Akerman plays Bobby’s whip-smart wife Lara Axelrod, David Costabile’s compelling Mike “Wags” Wagner and Condola Rashad’s Assistant DA all are punching above their weight here. The intensity of this show is grounded in a reality that is relatable: reputation. 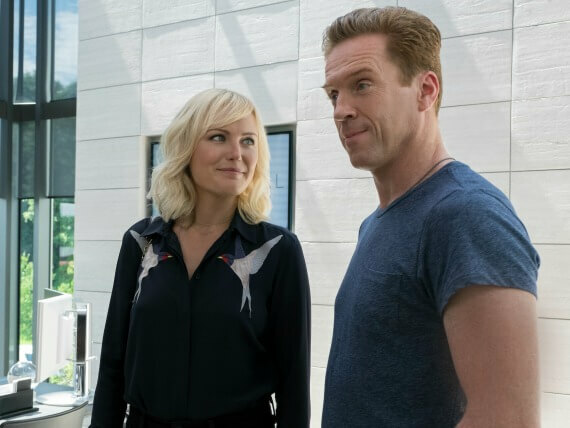 Unlike zombies (or frozen zombies) or even embedded spies, “Billions” is based on how important our reputation is to our relationships, our careers and even how we feel about ourselves. Is the world hanging in the balance? No, and frankly that’s refreshing. It’s just integrity that’s on the line and that is everything. I think this might have something to do with being forced to watch “Murder She Wrote” as a kid. 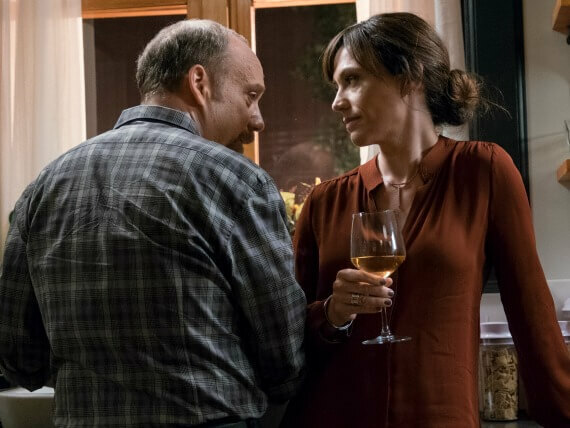 The joy of “Billions” is that it demands you pay close attention to what’s said and to the body language of the characters. There’s a lot going on in each scene in terms of unspoken thoughts/reactions that you have to keep track of in order to fully enjoy what’s unfolding before you. It doesn’t lead you forward with breadcrumbs the size of small dogs. That’s smart TV. If you work long enough in the corporate world you meet someone that, for whatever reason, you can’t stand. They represent everything you’re against (and the dislike is mutual). And so the machinations begin. “Billions” highlights two people trying to destroy each other with very different strategies, tools, powers, and organizations at their disposal. That’s fascinating to watch. Rhoades and Axelrod have very different worlds they have to navigate and both have to deal with pressures within their own systems. It’s not a given they’ll stay on top long enough to defeat their foe, and so the pressure comes from within and without. Remember how as a kid (and as an adult) you often wondered who’d win in a fight between Batman and Superman? “Billions” is exactly like that. Which is most important to you? How these come into conflict with each other is just part of the human experience, but in “Billions” how these clash take on Shakespearean proportions. For example, If your spouse committed corporate espionage to get ahead would you forgive them or divorce them? This show is a meditation on morality and the meaning of justice and the deep essential question of our times: if we give up our convictions and ethics just to win… what have we won? The role that therapists play in “Billions” (and there are three therapists in the show) is important and handled fairly. Imagine if the infamous Dr. Jennifer Melfi from “The Sopranos” actually worked for Tony Soprano and you get a sense of the complications faced by Dr. Wendy Rhoades as Ax Capital’s resident shrink and personal support to Bobby Axelrod. I always appreciated “Mad Men” for daring to show therapists as something others than a guiding light with Dr. Faye Miller’s work as a consumer research analyst. It’s interesting dramatic fodder to see psychologists as potential evildoers, using their powers for nefarious purposes, but not quite as obviously evil as, say, Dr. Lecter. Can ‘Billions’ Stay on Top for Long? “The Americans” on FX has spun back up and so “Billions” might not last long on the throne in the “game of thrones” which is Peak TV but right now it’s the hottest show on television.